USA all natural white beeswax no chemical bleaching. 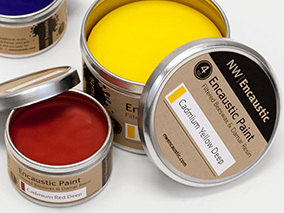 Rich color from NW Encaustics ready to use. For pick-up orders, please call ahead we will try to have your order ready when you get here. We have expanded our 10 for 9 FRAGRANCE SALE to include all 1 oz and 4 oz candle fragrances. If you are a registered user the rewards will be tallied and applied when you reach 10. Otherwise you will need to purchase all ten in one transaction to earn the discount. We offer a FREE BASIC CANDLE MAKING CLASS (We supply everything) by requests on Saturdays. Our Free classes are intending for candlemakers who need help or people who are new to candlemaking. Repeat attendees will be charged $5.00 for each additional class. Swans candles and candle making supplies is a family owned candle and candle supplies business located near Tenino Washington, that prides itself in its attention to customer service and satisfaction. Our store opened in 1973 and have now moved into our own metal building. We cater to the smallest hobbyist to the largest manufacturer. We stock Natural White and Yellow beeswax, our beeswax is filtered naturally with no chemicals used. Encaustic artists, candlemakers & cosmetic makers love our natural beeswax. Our paraffins, soys & natural waxes are highly refined and easy to use. We also have a large selection of high quality natural essential oil based candle fragrances that are usable in all types of waxes/oils and other applications. Most orders shipped are within 24-48 hours. We ship worldwide. We normally ship using Fedex and USPS. If you have an account with a shipping carrier you are welcomed to use them as well. Heavy orders can also be shipped by truck or barge as we have a forklift on premises. If you do not see what you want e-mail us at "candles@swanscandles.com"
As you can see we have a lot to offer and are always adding more items. So spend some time surfing around our web site for an enjoyable visit and please bookmark us for all your candle, soap & lotions supplies. Chardonnay Wine candle fragrance oil. Saturdays 10AM - 4PM PST. We offer to open other hours by appointment only. Running late? Give us a call and we MAY be able to stay open late.